"Your book highlighted the problem of fraud against seniors...an excellent mystery coupled with a great public service announcement!" 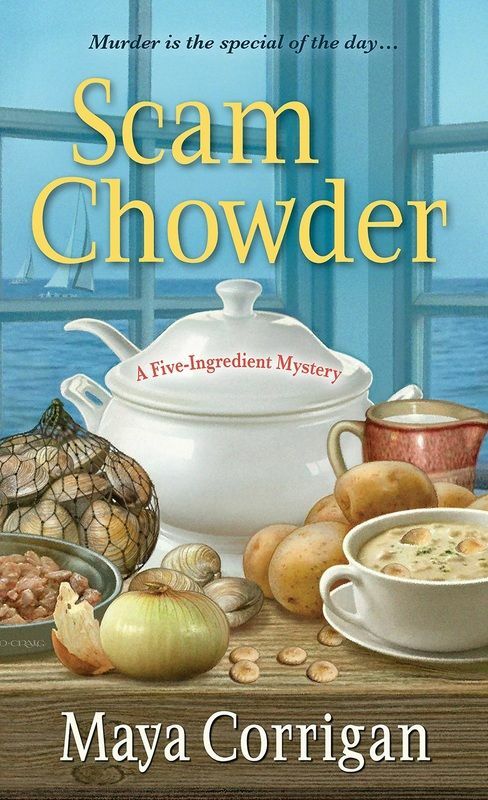 Like other cozy mysteries, Scam Chowder has its light moments, but it also explores a serious subject, as the above comment by a reader indicates. Financial fraud against seniors is rampant, a crime often under-reported and under-prosecuted. I learned a lot about this type of swindle when financial con artists targeted my father. With the sleuth's grandfather in the cast of the Five-Ingredient Mysteries, I had a perfect opportunity to share what I'd learned about such scams. In the second Five-Ingredient Mystery, Val prepares chowder for Granddad to serve at his dinner party. He doesn't tell her that he plans to expose one of his guests as a financial scammer targeting retirees. When the suspected scammer dies after eating the chowder, Granddad is the chief suspect. In trying to prove his innocence, he and Val uncover a variety of scams against retirees. Retirees aren’t the only people victimized by financial scams. Bernie Madoff swindled a lot of people who weren’t retired. But scammers target older people in particular for good reasons. Retirees have nest eggs to invest. They want their money to grow so they have enough to last as long as they live and to leave something for their children. The lure of a high return on investments is hard to resist, particularly when interest rates are low. So older people, like younger ones, fall for too-good-to-be-true investment schemes. However, older people aren’t as quick to report such swindles. Once they realize they’ve been defrauded, they are often reluctant to tell anyone about it. They’re ashamed at being taken in and afraid they’ll lose control of their money if their relatives find out about the fraud. Even if victims report the fraud to the police, it’s unlikely they’ll get their money back or that the con artist will be charged with a crime. Financial fraud can look like bad investment advice, and you can’t punish someone for bad advice. In cases where the fraud is blatant enough for a criminal charge, the con artist counts on older victims being bad witnesses whose memories are hazy. ​If you want to know more about financial scams against retirees, visit Top Ten Financial Schemes at the National Council on Aging site and How to Avoid Elder Fraud on the comparitech site.